Growing tomatoes is a simple process, but you’re going to have to know how to trellis tomatoes in order to get the most out of the plant. That’s why we’ve put together this guide of the ten best tomato trellis so that you can make an informed decision about what your plants need! We’re going to check out some of the information you’ll need to know about each product before we get to the reviews, so let’s get started! Material: What is the trellis made of? Popular materials are steel and wire, or some combination. Most steel or wire trellis will come wrapped in a plastic coating for the best reaction from your plants. Choose a sturdy trellis! Pieces: Some of the products on this list come with just one trellis, while others come with up to four at a time. You’ll have to figure at the price to determine if the multiples or the singles are a better value. Easy Storage: You aren’t going to keep your tomato trellis arrangement up year-round. On the off-season, you’re going to want them to fold up and store nicely so they don’t take up a bunch of space in your storage shed. Color: The color of the trellis can influence how your garden ends up looking, so keep that in mind when choosing to purchase one. Silver is standard, but green blends nicely. Other colors are also available, so choose your favorite. Size: These are the dimensions of the trellis so that you know how big it is and how large your plants could potentially grow with them. This usually only refers to their size when they are fully assembled and set up. Warranty: If there is some sort of manufacturing error that forces your trellis to malfunction, the assurance that it will be replaced is nice. A warranty does just that - within the time limit, you could get a refund or full replacement. Now we can get to the tomato support reviews! We only want to provide you with the best options for tomato fence, so we’ve researched and reviewed a selection of products - so you’re sure you’re going to be getting the best of the best. Take a look at our top pick and budget pick first before checking out the rest of the list as well. You might find your perfect garden solution on our list! Our top pick is this tomato wire trellis from Gardener’s Supply. 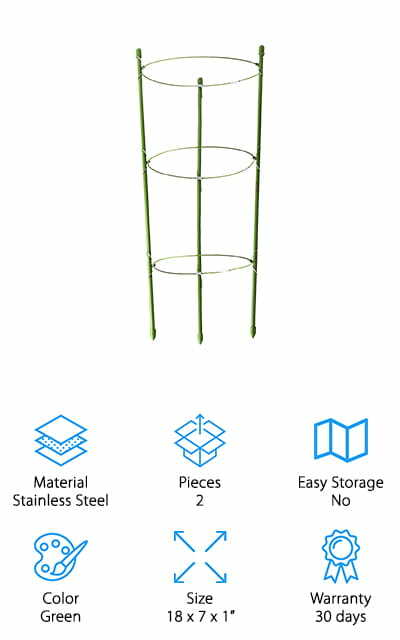 It’s a shorter cage, but it’s super strong so that your tomato plants can remain upright with no issue. The openings are a large 8 inches that make harvesting a simple affair. It’s made of heavy 10 gauge steel wire, covered with powder to keep it from rusting. The different panels are hinged so that when the season is over they will fold flat and store compactly. These are definitely heavy-duty cages that will beat out any of the old gardening trellises that you might have on hand. You don’t even have to tie the plant, because the shape allows the plant to be supported on all sides. It also promotes air circulation, cleaner harvests, and less plant-killing diseases. We love all of the benefits of using these fences! That is why these are the best tomato trellis that we found during our research. 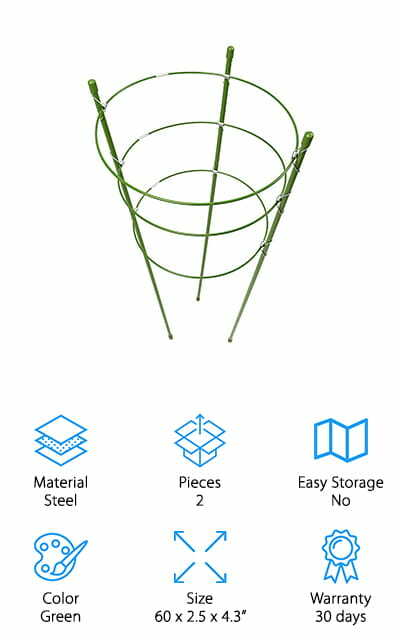 Our pick for the best cheap tomato trellis is this Yardgard cage. This thing is packed with features. 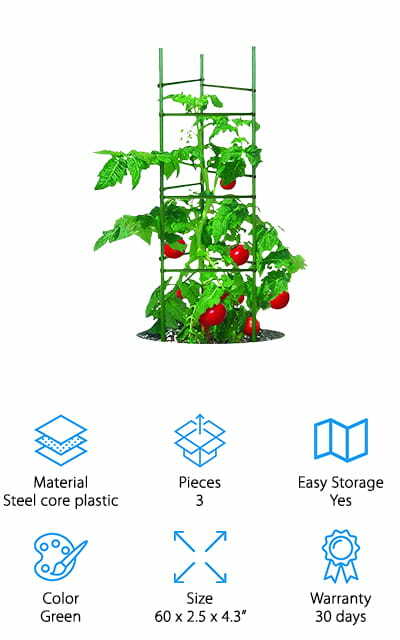 There are three structures in this pack, which are great to use in the growth of all types of climbing crops, not just tomatoes. The stakes are a durable steel construction that is nearly five feet long and plants firmly into the ground. The core of steel is covered with a thick plastic coating that your tomato vines will love. It’s much sturdier than your current aluminum trellis set up. 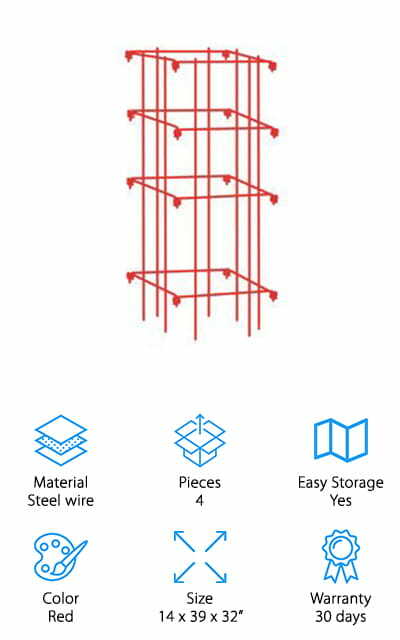 When you buy this system, you also get nine additional arms so that you can create a full cage with just these three trellises. That’s a pretty amazing system if you ask us! You can place these arms anywhere, and they secure together well so they aren’t going to fall off. It’s extremely easy to set this system up, and it can be done in just a few seconds! 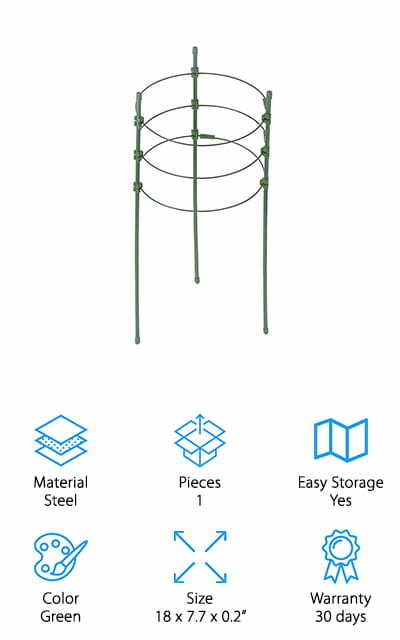 This Panacea Support Cage is a great tomato fence trellis, and there are ten included so you can have an entire system of tomato plants and other climbing crops, such as peppers or perennial flowers. The smallest end of one of these cages is approximately six inches across, so it’s perfect for harvesting small tomatoes or other plants. The standard silver color really accents your flowers well and can be used to train morning glories as well. When the offseason comes, they stack down together so that you can store them easily and without taking up too much space in your shed. They’re perfect for smaller plants and container gardening. And they’re sturdy enough to keep your plants upright, right where you need them! We love that instead of just one cage or three of them, this set comes with ten amazing trellises. A small enough garden won’t need to purchase any additional cages! Dasco Pro makes these heavy-duty steel tomato vine trellis. You won’t have to worry about training your tomatoes to curl around this structure and remain upright, as they’ll do it of their own accord! They are going to love clinging to the galvanized steel. The legs are long and strong enough to firmly secure the cage. There are five different plant rings that will help support the growth of your favorite climbing fruits and vegetables. There is plenty of room for your plants to grow all season long with this larger cage design. It only weighs five pounds, and it stores really easily come the winter: just fold it flat and you can even hang it on the wall of your garage! It’s just as sturdy as a wooden tomato trellis without the worry that water will soak in and damage the wood during watering or rain. And it truly stands tall and sturdy with just the stakes. This EasyGo Tomato Trellis is a great planter structure that you can get set up in no time for either new plants or established ones. It won’t put any strain on your plants to use, no matter how old or large the plant is. This tomato vine trellis is made of steel, and the stakes are sturdy and long enough to make the planter stable on it’s in the ground. There are attachable arms so that you can configure your new planting situation however you want. It’s specifically made to increase support for vertically climbing plants, so you get better air circulation and your plants ripen more naturally. You can move the attachable arms as your plant grows and matures and its needs change. Green trellises are really nice because they can only add to the look of your garden and will blend right in with your plants. The size also makes it a great cherry tomato fence! Anleo makes the next product on our list. This trellis, like most on our list, can easily be modified to support tomato string trellis work, if that’s something that you’re looking for. It’s also the ideal construction that you could use to support your flower pots and help your climbing plants through the growing season. You can also put it outside for use with climbing flowers like Morning Glories, or ivy vines that are beautiful and cling to structures like this. It’s made of durable steel, with a rust-resistant plastic coating so you don’t have to worry about rust damage on your plants from watering or rain. The three rings can be adjusted to support plants of any size. They can be readjusted as often as you need to in order to maintain the health of your plants! The rings come in three different diameters: 5 inches, 6 inches, and 7 inches. Give your plants the best! This single-pack Origin Point Trellis is amazing and large enough to use with all of your outdoor plants! Any type of climbing fruit or vegetable will benefit from the use of these supports! At nearly 4-feet tall, they will give all of your plant's plenty of time to grow in an environment that is safe, nurturing, and sturdy. Even the hardiest vines will have no problem clinging to this powder-coated steel cage. We love the green-colored finish because it will blend so well with the rest of your garden, and create a natural-looking space. 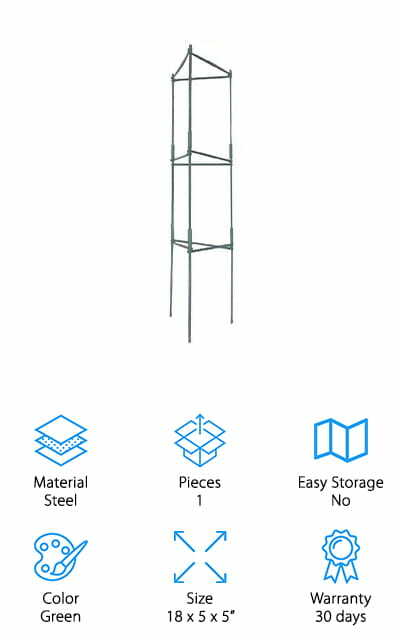 When the off-season comes, don’t get stuck with a lot of big racks to store – this trellis is easy to take apart and store in your shed or garage, and just as easy to pull out the next growing season! The powder coat helps it stay rust and fade-free! It won’t show any wear by the elements, even if you’re using pesticides to keep your garden. This two-pack of trellises by Yojoloin are perfect for your garden setup, no matter what or where that is! The support is small enough that you could even use it with a large flower pot and still get great crops! Often, when tomato plants and other crops are too close together, there are all sorts of problems with the trapped moisture and humidity from watering. Not least among these is mildew, which will make your tomato plants inedible and might kill them. This trellis, however, keeps the plant’s shape and let air between the leaves, allowing more circulation and providing a better growing environment. The rings that are included can be adjusted throughout the process to maintain that healthy environment! We love these trellises for the fact that they help your garden flourish! You can use it for seeding as well because it’s on the medium size of gardening supports! Great for flowers and vegetables! The best part about these Funseedrr Supports is their versatility! You can adjust the size of the rings based on the size of your plants, and keep adjusting them through the entire growth cycle in order to better facilitate and support their maturation. Any climbing crop will have more success with this trellis because it gives the plants more room to grow and increases the air flow and watering potential to all of the plants. It’s made of durable steel with a plastic coating that is made specifically to resist the rust brought on by watering, rain, and the general moist atmosphere that accompanies tomatoes, peppers, and other climbing crops. 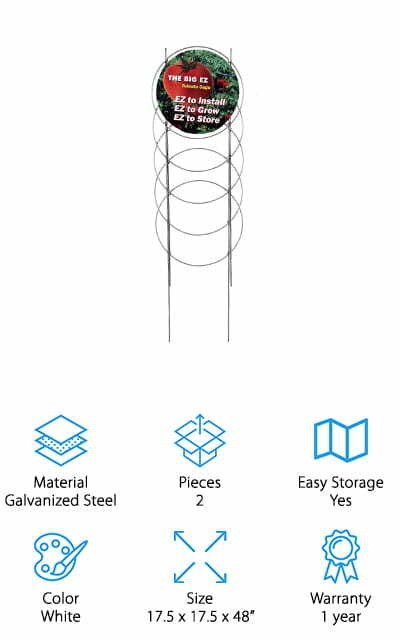 The stake itself is 17 inches high, and the three hoops come in 6-inch, 6.5-inch, and 7-inch sizes so it won’t matter how big around your plant is – there’s a ring on this support for you! We love the design of this single pack trellis! These steel trellises by Pannow are excellent for your plants! They are easy to use and set up, with three rings that can be adjusted according to the size of the plant that you’re using it with. 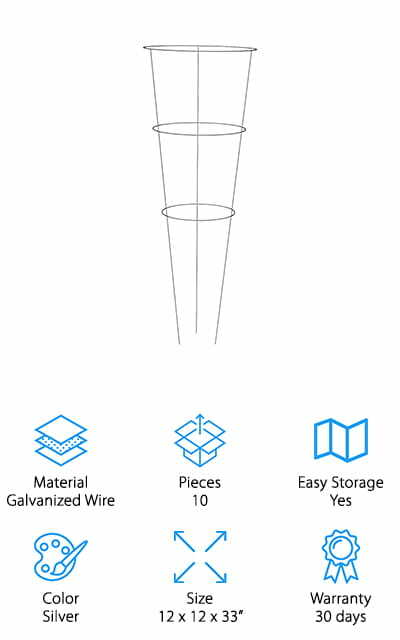 The wire is strong and coated with a thick plastic as well as an ultraviolet treatment to keep it strong and sturdy. It will resist the rust from rain or watering the plants. 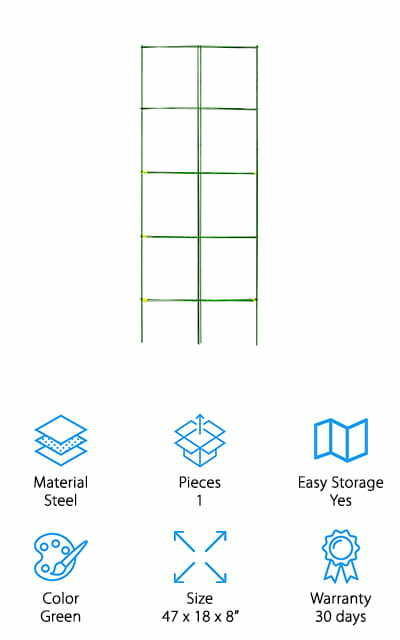 This trellis helps to support your plants, helping them to grow into better, fuller crops (or even ornamentals) throughout the growing season. It is also resistant to corrosion by chemical fertilizers and pesticides, and we love that about it. You can use this trellis to help point Morning Glory in the right direction, as well as keep peppers and eggplants growing strong. Of course, you can also use this trellis to grow tomatoes and sweet peas, so it’s great for all of your climbing plants!